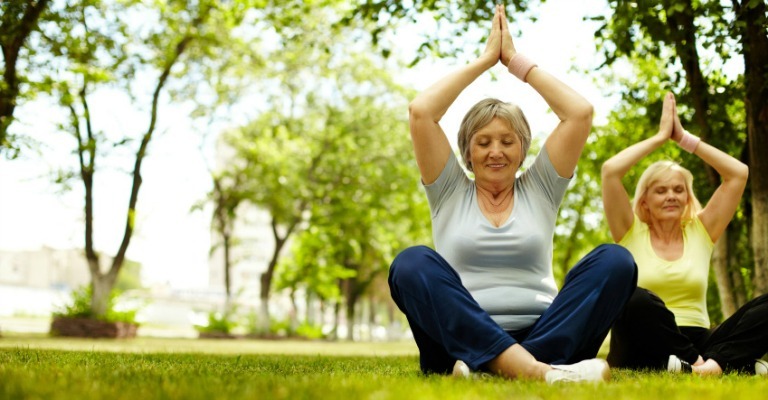 Alternative therapy is important, especially for seniors; however, when most seniors think of Yoga, “oiling the joints” is probably one of the last things that comes to mind. But that’s how 91-year-old Bernice Bates describes an ancient Indian tradition that has been around since at least the Stone Ages. Since the beginning, Yoga has been utilized to help improve the human condition, while incorporating a meditative and spiritual core – principles that still remain intact today. There are numerous benefits to practicing Yoga, like healing aches and pains, increasing blood flow, boosting immunity, and improving overall health. Bates has been practicing Yoga for the past 50 years and was recently named the “World’s Oldest Yoga Teacher,” by the World Academy of Records and the Guinness World Records, but for older adults like her, the body starts to become less fluid with age. Yoga actually helps to get the Synovial Fluid circulating between the bones again. Exercising the joints regularly helps facilitate range of motion, while preventing degenerative arthritis and moderate disability by “squeezing and soaking” unused areas of cartilage. It is also known to assist in lowering stress levels, help control blood sugar in diabetes patients, enhance respiratory function, increase bone density and moderate many types of common chronic pain experienced by seniors. Another thing to keep in mind is that osteoporosis and low bone density are a reality for many older Americans especially postmenopausal women. Miami Yoga instructor Melinda Atkins, says the weight-bearing activity of yoga actually helps slow bone thinning, lowering the risk of the disease. And of course, as we age, our through process tend to decline. Breathing exercises help harmonize the left and right hemispheres of the brain, connecting to the logical and emotional sides of the personality. “Focusing on the breath and synchronizing it with movement helps keep the mind clear and engaged,” says Atkins. As beneficial as Yoga is, it’s important to start off slow, especially if you haven’t been in the habit of exercising or if you suffer from serious health conditions. Freedom Home Care recommends consulting your physician before starting any workout regime and then find a class for beginners that is specifically designed for people over 50. Many studios offer props for modifications, while certified Yoga instructions can help to ensure all poses are properly aligned and carried out in order to prevent any unnecessary injuries.